Hi readers! So, I know I took a small hiatus the last week, but that’s because I’m refocusing the blog a little bit. You’ll see that things have been slightly reorganized, and I’ll be doing a bit more in the coming week, so posts are going to slow down a bit until then. 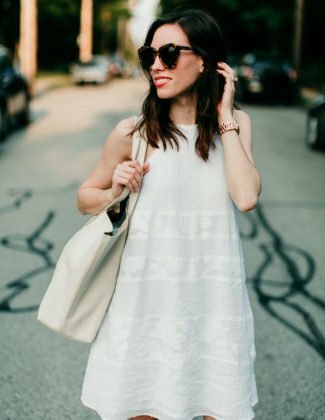 As you may know, I had been preparing for my first capsule wardrobe for this fall but, to be totally honest, I was so excited about the idea–and fall weather still seemed too far out of reach–that I decided to test out the idea for summer. I took everything out of my closet and, one by one, hung my very favorite pieces back up. I found that once I had chosen my favorite pieces, it was easy to come up with my color palette, placing and replacing items that did or didn’t fit the overall scheme. The end result contained 50 items, including shoes and outerwear (not including accessories, bags or jewelry). Choosing the color palette actually ended up being very easy for me. I very clearly favor white and beige so those became the primary colors, and then I had a few pops of mint green, denim and navy as accent colors. Having a set color palette has made mixing pieces to create unique looks so easy. Getting ready in the morning is a breeze. Though my options are limited, all of the pieces generally go together. But my favorite part? I love literally every piece in my capsule, so there’s never a day that I put something on and feel frumpy, lazy or unprofessional. The limited number of pieces really forces you to get creative with your outfits. It’s made getting dressed so much fun! And while I did not include jewelry, bags or accessories in my capsule, I’ve been wearing these delicate pieces almost every day: a simple pair of diamond stud earrings, a two-tone watch, a few delicate gold rings and my favorite cuff bracelet. Since I was late to the scene with my summer capsule, I didn’t plan to write an in-depth post on each of the pieces I selected BUT I am definitely planning to do so for fall. At this point, the best advice I could give someone interested in starting their own capsule wardrobe is to do what works for you. There are a ton of resources out there, all of which come with their own set of guidelines and rules. Just remember that these are only guidelines; everyone’s lifestyles are different. My capsule has 50 items, and is comprised of shoes (heels, flats, sandals and sneakers), tops (blouses, tees, cardigans), bottoms (skirts, pants, shorts), dresses and outerwear (denim jacket and a trench coat). This amount seems to work for me, and contains mostly work appropriate pieces. I have started staging a few things for fall, and l I think it may be a bit more difficult to slim down to 5o items for that capsule, but we will see. I had tossed around the idea of creating two separate capsules: one for work, and one for weekend. But, it’s been so nice having everything in one spot that I am leaning towards one capsule with 50-60 pieces, instead. I’ll keep you posted–thanks for reading! If you’re trying this out too, please leave your comments, tips, and thoughts below! So excited to see your capsule! It’s such a nice feeling to actually like everything in your closet lol. Thanks, Catherine! It really is. I have had so much fun with this concept. It feels great to minimize and simplify.